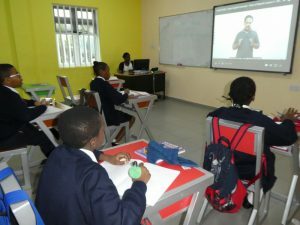 LEARNING AT SASCON INTERNATIONAL SCHOOL MAITAMA, ABUJA. Sascon International School, Maitama, Abuja places a very high value on academic excellence hence the school’s motto; ‘ The Pinnacle of Learning’. At SASCON, our students are being prepared for WASSCE, SSCE, BECE and CAMBRIDGE IGCSE examinations. We are also interested in the moral and spiritual aspects of the students’ life which are also of equal importance thereby grooming them into individuals with sound mind and reverence for God and man.